Even as she set the quill aside and asked for sealing wax, Catelyn sensed that the letter was like to be too little and too late. Maester Vyman did not believe Lord Hoster would linger long enough for a raven to reach the Eyrie and return. Though he has said much the same before . . . Tully men did not surrender easily, no matter the odds. After she entrusted the parchment to the maester’s care, Catelyn went to the sept and lit a candle to the Father Above for her own father’s sake, a second to the Crone, who had let the first raven into the world when she peered through the door of death, and a third to the Mother, for Lysa and all the children they had both lost. Well, I think I may have just discovered what the inspiration was that George RR Martin used when developing the Black Gate and the well to get there. Maybe? Maybe not? I am going to speculate anyway… As I speculate the hell out of this, I can already tell that this will be a post packed with information, which means the info will arrive in waves. Keep checking back in for updates. Sidenote: If someone has made this connection before, please message me so that I can give credit where credit is due. For this section, I would recommend reading The Skin Trade as there is an immense amount of Nightfort prototyping in that story (those book quotes to be added shortly). And we know that GRRM used Hadrian’s Wall (discussed here) to develop the Night’s Watch wall. But what I want to focus on is the well at Nightfort and the Black Gate itself. This could also serve as Castle Black’s gate in a more secondary way, and there are connections to Melisandre, fire and gates; a common fire + gate theme that GRRM uses quit often in his works! Maybe some secondary connections to the Cave of the Three-Eyed Crow? However, seeing how Bran is going to be the next Three-Eyed Crow, my money is on the squirrel boy no matter where it is placed. Wall of the Crow, highlighted in red, upper left. Photo credit: Image © 2001 Space Imaging Inc. I suspect that the well and the Black Gate are inspired by the Wall of the Crow in Egypt that is in relation to the Pyramids of Giza. As a reader may know, I do have my ideas (in progress) as to how Pyramids and Towers are imperfect parallels; similar on the glance, yet very different when looked at deeper. pyre-pyro-pyramid… volcano, Doom of Valyria, dragons in and on the pyramids, and Daenerys in Meereen acting god-like (ziggurat, and Bakkalon). tower-tree-tuition (knowledge)… old gods, weirwood, ice magic, the Citadel, Bran, Jon, Hardin’s Tower, library at Winterfell, Odin and Yggdrasil, etc. 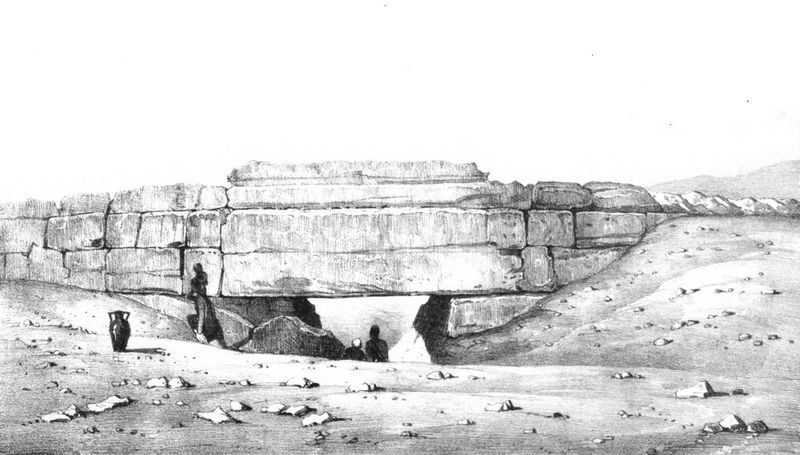 There is a massive, ancient stone wall that stands a few hundreds yards south of the Sphinx. But because it lay partially buried and overshadowed by the larger, more famous Great Pyramid, Sphinx, and other pyramids, tourists have hardly noticed it.Known locally as the Wall of the Crow (Heit el-Ghurab) it is 200 meters (656 feet) long, ten meters (32.8 feet) high, and ten meters thick at the base. The Wall is the northwest border of a tract of low desert that we designated Area A: our excavation site.We suspected that the Wall of the Crow dated to the Old Kingdom 4th Dynasty (2575-2465 BC), like the Giza Pyramids and the Sphinx, but we do not know why the Egyptians built it. Evidence suggests that they never completed the mammoth undertaking. They never dressed the masonry to produce a finished face to the structure, as was their standard practice with pyramids, tombs, and temple walls. We can now say for certain that the Wall of the Crow was built as part of our 4th Dynasty (2551-2472 BC) complex and the archaeology has led us to form some ideas as to its function. 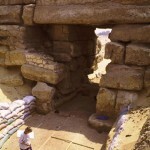 The great gateway in the Wall of the Crow may be one of the largest gateways from the ancient world. 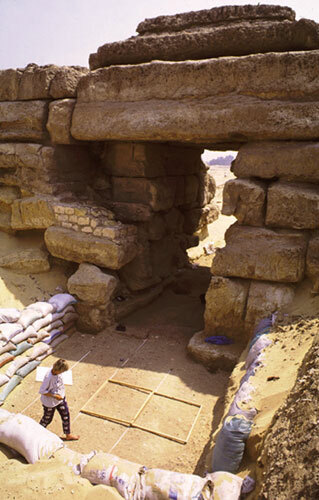 It has been visible for the last 4,500 years and yet very little has been written about it.Once we cleared away a thick, sandy overburden, we discovered what an impressive structure the gate is—2.5 to 2.6 meters wide (about 8.5 feet or five ancient Egyptian cubits) and about 7 meters (23 feet) high. Because the base of the Wall is more than 10 meters thick, the gate is actually a short tunnel.The ancient roadway going through the gate was paved with worn or abraded ceramic fragments and laid out with a subtle camber—the sides slope down and away from the center—a common feature of ancient roads. Along the length of the south side of the wall east of the gate, we cleared a ramp-like slope on the surface of an embankment of limestone chips. This mason’s debris must have been waste from building the wall. It also may have been used as a ramp to drag the massive lintels up over the top of the gate. After placing the stones, the builders left the debris immediately in front of and inside the gate. Upon this debris, traffic formed a path that slopes down 2 to 3 meters (6.56 to 9.84 feet) from north to south. The path passes through the gate to a broad terrace formed of compact sandy masons’ debris that extends at least 30 meters north of the gate. Geoarchaeologist Karl Butzer, who studied the environmental history of our site, believes that the 4th Dynasty Egyptians built their settlement on the outwash of a wadi, a stream bed that occasionally carried heavy floods running off the high desert. The Wall of the Crow stands just to the south of the stream bed and could have served to deflect the floodwaters. Caches of animal bone that we encountered in the same sand layer as some of the nearby Late Period burials are another sign of the Wall’s sanctity.One cache included two skulls—from a bovine and a smaller animal, possibly a goat. Another cache contained two cattle skulls. In the spring of 2000, when we began clearing the southern side of the Wall of the Crow near the east end, we encountered a third cache—a bovine skull and a Late Period amphora tucked into a niche between the blocks of the Wall. The azimuth of the prehistoric alignment of world wonders as it crosses over the Giza Plateau is five degrees north of due east. Although all of the pyramids and temples on the Giza Plateau are very precisely aligned with the cardinal directions, the Wall of the Crow is aligned five degrees north of due east and five degrees south of due west, in alignment with the line of ancient sites as it crosses over the Giza Plateau. The equidistant azimuthal projection below is oriented to the cardinal directions and centered on Giza. As a result, the angle of the line of ancient sites is the same as the azimuth of the line as it crosses over Giza. From left to right, the marked sites are Easter Island, Nazca, Ollantaytambo, Tassili n’Ajjer, Siwa, Giza, Petra, Ur, Perseopolis, Mohenjo Daro, Khajuraho, Pyay, Sukothai and Angkor. Here is a great ten minute video if you prefer to watch or listen to the details of this wall. Some of this Wall of the Crow information from any source may possibly be considered pseudoscience, but this just makes it better fodder for the literary folk to eat up. I recently speculated (as some other fans have in different ways) that what readers think of as the Night’s Watch vows are indeed and amended (corrupted?) version of the original, much simpler, vows. Read here on Westeros.org until this information is brought to this blog. Samwell Tarly, Bran Stark. Passing through the wall. Artist: Kerry Barnett. The only part of the the Night’s Watch vows that are needed to open the Black Gate are the speculated old vows. This happens in a Samwell chapter, but it happens in front of Bran, and Bran knowing these vows is probably set up for a future plot necessity. Basically, old vows versus new vows. That was the only thing he liked about the kitchens, though. The roof was mostly there, so they’d be dry if it rained again, but he didn’t think they would ever get warm here. You could feel the cold seeping up through the slate floor. Bran did not like the shadows either, or the huge brick ovens that surrounded them like open mouths, or the rusted meat hooks, or the scars and stains he saw in the butcher’s block along one wall. That was where the Rat Cook chopped the prince to pieces, he knew, and he baked the pie in one of these ovens. The well was the thing he liked the least, though. It was a good twelve feet across, all stone, with steps built into its side, circling down and down into darkness. The walls were damp and covered with niter, but none of them could see the water at the bottom, not even Meera with her sharp hunter’s eyes. “Maybe it doesn’t have a bottom,” Bran said uncertainly. So the Black Gate could possibly be based on the Masonic Initiation Wells <<< check it out for the picture at least! one of its most fascinating features is located beneath the ground – a pair of wells spiraling deep within the earth. The pair of wells, known as the ‘Initiation Wells’ or ‘Inverted Towers’, consist of ‘winding stair’ architecture, which carries symbolic meaning including the death/rebirth allegory common to many hermetic traditions. At the bottom of the well there is a compass over a Knights Templar cross, which is said to have been Monteiro’s herald and a sign of his Rosicrucianism. This actually reminds me of the dragon mosaic Jaime finds at the bottom of the well in KL when he is searching for Tyrion and the dragon talks to him and says he was waiting for Jaime. Now that I think about it, if GRRM did take these initiation wells as inspiration, maybe that kiss and drop of salt is like a baptism??? Ok. Why is the wall always weeping??? Check here. Well, Bran and Jon both have deep connections to Bloodraven. In life, Brynden Rivers had his loyal following of archers called the Raven’s Teeth. During Jon’s time as Lord Commander of the Night’s Watch, he implements daily archery training because he says it is a skill that has been neglected. Jon also personally fights off the “wildlings” during the first battle while on top of the wall with his archer brothers. Jon comes to realize that the free folk are actually supposed to be saved as they are part of the realms of men, and Jon and Val have future plans anyway. Brynden Bloodraven Rivers is most known for his kinslaying while on the Weeping Ridge at the Battle of Redgrass Field. There was some guilt with that and resulted in Bloodraven sent to the wall by Aegon V. I am not making any claims that BR is watching Bran and/or Jon through the wall, merely this is George keeping within the theme of the story by making these connections. All three, Bloodraven, Bran and Jon, have a connection to a weeping wall/ridge. The Weeping Ridge was a ridge integral in the defeat of Daemon Blackfyre at the Battle of the Redgrass Field. After Daemon Blackfyre’s defeat of Ser Gwayne Corbray of the Kingsguard, he stayed to defend him while the battle swept around them. While he was defending the fallen knight, Bloodraven and his Raven’s Teeth had reached the top of Weeping Ridge and began targeting Daemon’s standard. From this vantage point Bloodraven and his Raven’s Teeth killed Daemon and his twin sons, Aegon and Aemon Blackfyre. Thank you for reading the jambles and jumbles of the Fattest Leech of Ice and Fire. As always, please ask if there are some book quotes you would like me to add. Previous What will happen to Bowen Marsh?